Carya hunanensis Cheng & R. H. Chang. "Hunan Shan he tao". Hunan hickory. Hunan hickory was first described by Cheng and Chang (in Chang and Lu, 1979) from material collected in Hunan province (Tsoon Pu-ching 1113, in Herb. Coll. Silv., Nanking). The species is widely distributed in western Hunan and eastern Guizhou provinces, and has been reported from the following counties in Hunan: Chengbu, Tongdao, Chien Yang, Dong An, Jing Xian, Quan Yang, Huai Hua, Hui Tong, Yuan Ling, Shu Pu, Zhi Jiang, and Ma Yang (Cheng and Chang, in Chang and Lu, 1979; Hunan Research Group, 1988). In Guizhou, the species has been reported from De Jiang and Liping counties. The senior author has seen specimens identified as C. cathayensis collected from Tuh Shan (Y. Tsiang 6467) and "from between the towns of Kutschou and Liping near Mantunggai" (Handel-Mazzetti 2151) which are believed to be C. hunanensis. Hunan hickory has also been reported from Sanjiang Sien, Guangxi province (Cheng and Chang, in Chang and Lu, 1979). Hunan hickory is cultivated in Hunan and Guizhou provinces. Nearly 4000 Ha are reported from Hunan, with most of that being in Jing Xian county (Hunan Research Group, 1988). According to officials of the Forestry Department of Hunan, most of the production is from wild trees, which generally begin bearing at about 10 years, and continue till 200+ years, yielding up to 300 kg/tree. Nuts are eaten fresh or fried or are pressed for comestible oil. Nuts are also used medicinally for cough and as a cure for pain in the heart and lungs: nut meats, raw ginger, sugar, and orange peels are steamed together. On October 13, 1990, we collected from Hunan hickory trees in the Da Miao Kou region, near Dong An, Hunan. Trees were growing behind a small village, at the foot of a steep mountain slope beside a small river. Trunks were up to 36 cm dbh and had been damaged by beating during harvest. Few nuts were available, but some trees still held a light crop. The shallow, rocky, reddish brown clay soil was pH 8 in both the surface and subsoil, and was not calcareous. On October 18, we collected from trees of the species in Shao Zhai village, about 20 km northeast of Liping, Guizhou province. Trees were growing in old abandoned terraces, having been planted from native seed about 60 years previously. The soil was reddish brown clay loam in the surface and clay in the subsoil. Soil was not calcareous and had a pH of 4.5. Trees were 25 to 45 cm dbh with trunks damaged by beating at harvest. Trees were also severely damaged by shoot borers, and various other insect pests. In addition, a parasite similar to mistletoe was present in some trees. Hunan hickory is distinguished from C.cathayensis by its fruit: they are distinctly obovate, larger (3-3.5 cm long X 2.4-2.7 cm diam. ), have thicker shells (1.5-2.5 mm), and have husks which are winged only to the middle. 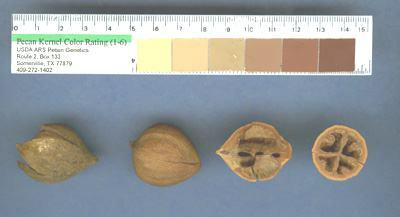 Husk thickness varies from 3-4 mm at the winged apex to 1 mm at the base. As in C. cathayensis, kernels are divided into 4 segments at the base by a well developed secondary septum. There are no lacunae in the septum or shell walls. Although previous reports indicate 5-7 leaflets in Hunan hickory, we observed 7-9 leaflets to be common.